We have big plans for 2018, among which are a series of new design kits and exciting collaborations in the works. Since starting the year sets the tone, we've made ourselves busy in January and launched two new design kits. Today on our blog we are going to share with you a bit more about these two new gems available in our Shop. When we work on new designs, we always start with research and inspiration. We go through functionality and layouts, taking in consideration content strategies specific for creatives, especially for photographers. Visually we draw our inspiration from traveling and from the impressive body of work of our clients. And this is how both Venice and Minima came about. Though aesthetically distinctive, both Minima and Venice are modern designs with a visual appeal which instantly adds character to any brand. We've created Minima from a place where a simple and minimalist living meets an adventurous and authentic approach to experiencing life. Though Minima is our newest design kit, we feel like it's been part of our creative's team imagination since the moment we launched Squaremuse. Minima combines structured and asymmetrical layouts to present imagery in a bold and memorable way. Black backgrounds will give your images a cinematic and dramatic feel, while the rest of the sections stay clean and have your viewers attentively focused on your imagery and wording. 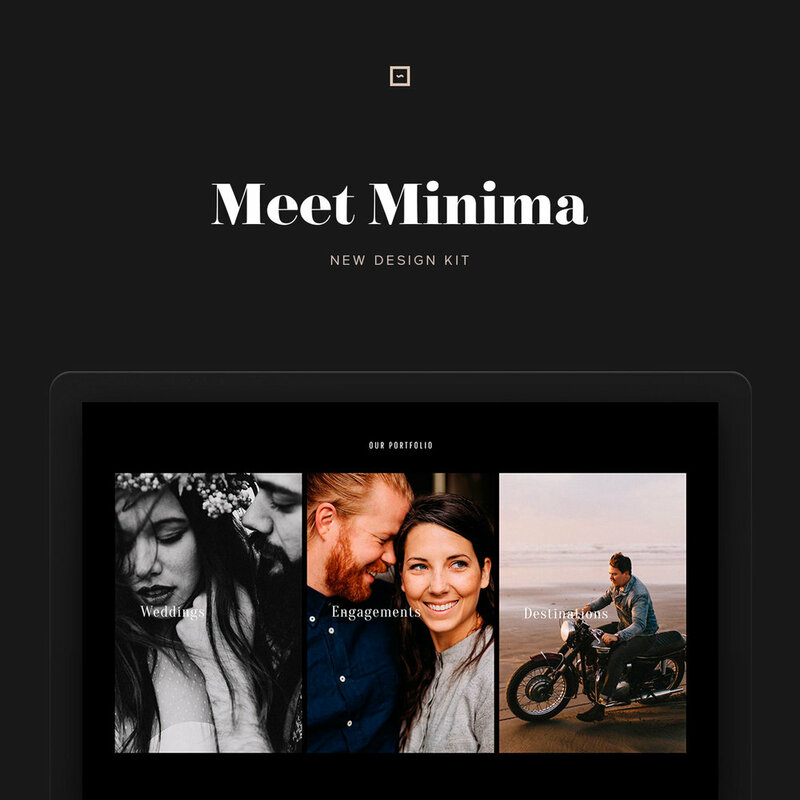 With multiple layouts for each page, Minima lets you select what fits you best to position your business and your personality without excess, striking the perfect balance between words and imagery. Minima's layouts and pages cover a range of content needs: from publications and press features to quick About statements, a number of layouts to present your Testimonials in a compelling way and link them to more extended stories on your blog or gallery, showcasing various photography categories, and providing extensive information on investment packages and FAQs. This design kit with its curated typography is great for photographers that crave some rawness in their brand identity, and want to stand out visually, and communicate the intent to experiment and push boundaries in their business and life in general. We are excited to offer Minima with an exclusive 20% discount till 5th of February. Use code MINIMA20 on checkout. Our goal for Venice was to create something fresh and airy, but also keeping it modern and elegant at the same time. We've started working on Venice right after a trip to Italy and our sensory experience has definitely influenced it visually. Venice has three Homepage layouts, all focusing on what matters most: showcasing portfolio and impactful imagery, About statements and information blocks to link through other areas of the site that are important for potential clients. The layouts satisfy the need for a longer landing page, as well as shorter versions when you'd just want to be concise and to the point with your content and services. Most of Venice pages have several layouts to choose from, but as with any of our design kits, you can easily add new blocks and layouts from existing Squarespace functionalities. Venice really stands out through the combination of curated typography and image based layouts. Its look, though, is finessed through a number of graphic elements: color backgrounds, stand alone letters, and illustrations; all of which are customizable. It is important for us to create details that allow to highlight the individuality of your brand and consolidates your own brand voice. The elements are easily personalized with available files in downloaded folder, where you can also find a free illustrations pack that we offer to all of our users. Till 5th of February you can purchase Venice with 20% off the price. Use code VENICE20 on checkout.